The Canadian Pacific Line’s 6,000-ton Princess Kathleen, queen of Alaskan liners, was 18 miles from Juneau on the last trip of the season from Vancouver, B.C. to Skagway, Alaska. It was 3:15 a.m. Most of the 425 passengers and crew, including Captain Graham Hughes, were sleeping. A light rain was falling, but the lookout reported fair visibility. 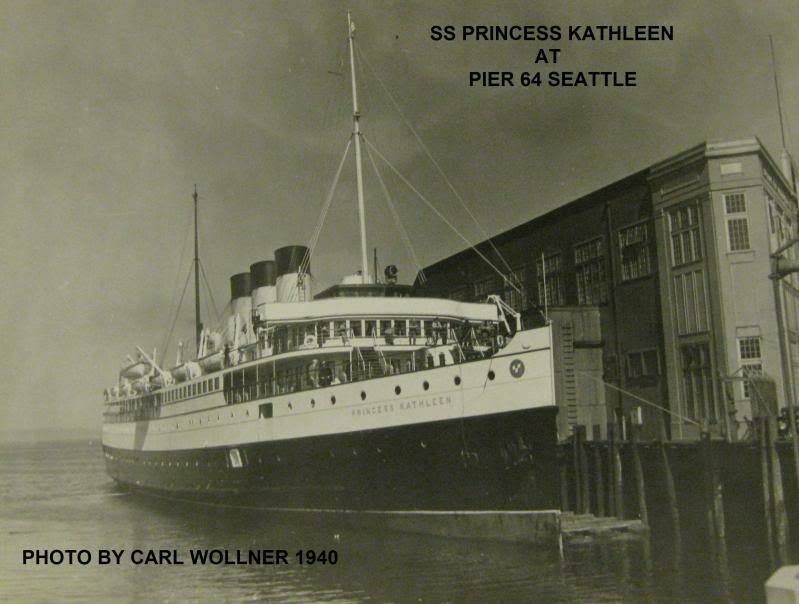 The Princess Kathleen sails to Alaska. The final moments of the Canadian Pacific small liner SS PRINCESS KATHLEEN on September 7th, 1952. 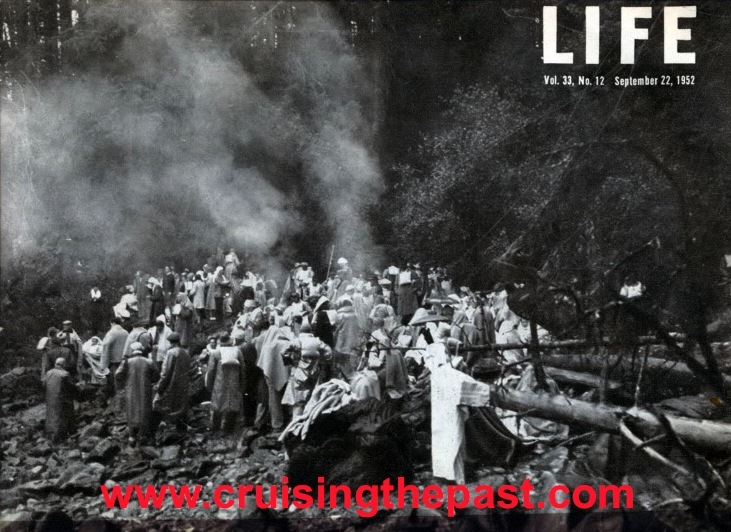 Life Magazin coverage of the wreck of the Princess Kathleen. Suddenly there was a violent shock and the frightening screech of tearing metal. Dazed men and women, thrown out of their berths, rushed on deck in confusion. Unbelievably, for the Kathleen was supposed to have been following a well-charted and well-traveled channel, she had steamed right into the shore onto a high ledge of the Alaskan mainland. Over the loudspeaker system, the purser told the passengers to abandon ship. One by one they went over the ship’s side, down ladders, and onto the rocky beach. They were luckier than the passengers of the Princess Sophia, which 34 years (1918) before near the same spot, had struck a shoal and gone down with 328 aboard. Passengers rescued – on the rocks. 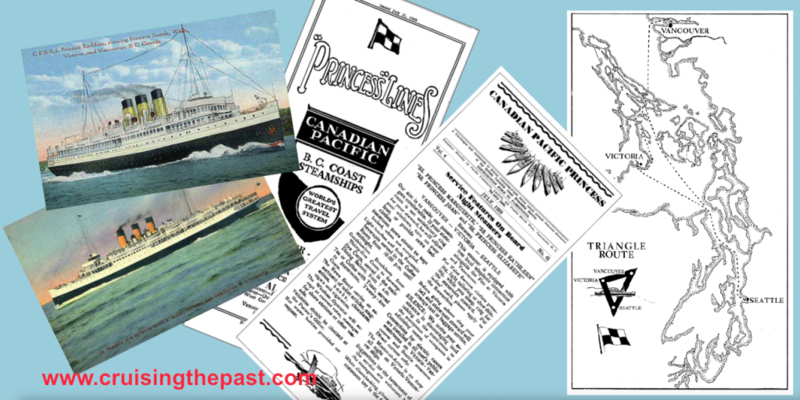 The Canadian Pacific Princess Kathleen was a popular coastal passenger operated by Canadian Pacific Steamships. 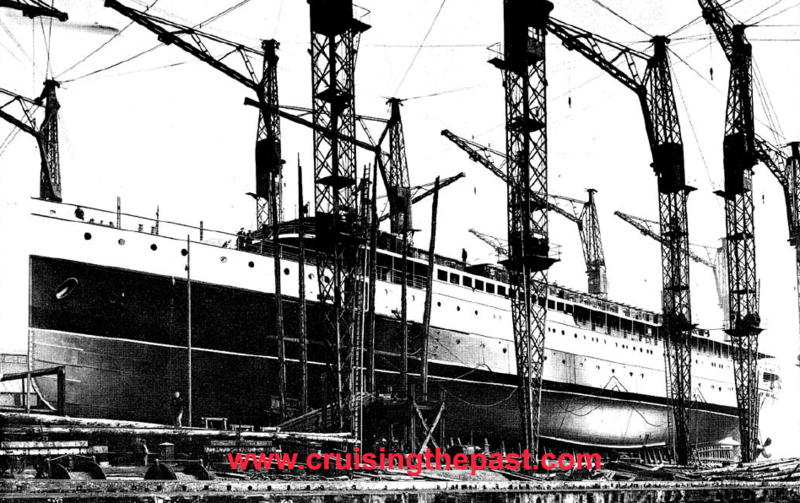 She was the predecessor to the Princess Patricia – the first “Love Boat” operated by Princess Cruises. 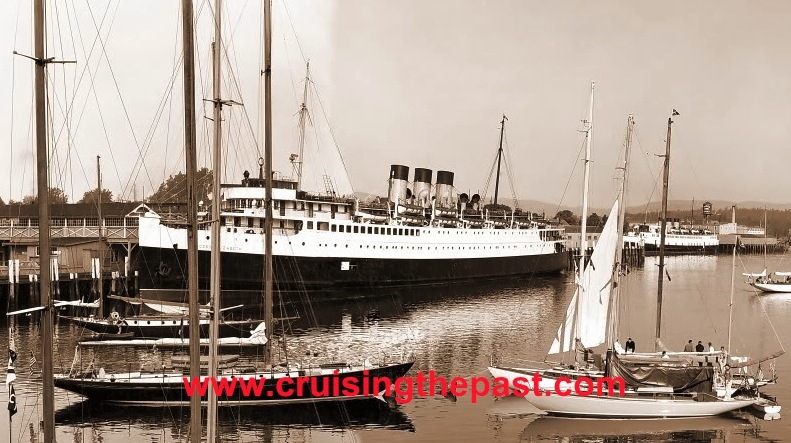 For most of the mid twentieth century, with the exception of World War II, the Princess Kathleen served most of her maritime career plying the coastal communities of British Columbia, Alaska and Washington. The Princess Kathleen, along with her identical sister ship the Princess Marguerite, were built to replace the aging C.P.R.S.S. Princess Irene and C.P.R.S.S. Princess Margaret which previously had been requisitioned by the British Admiralty during World War I. 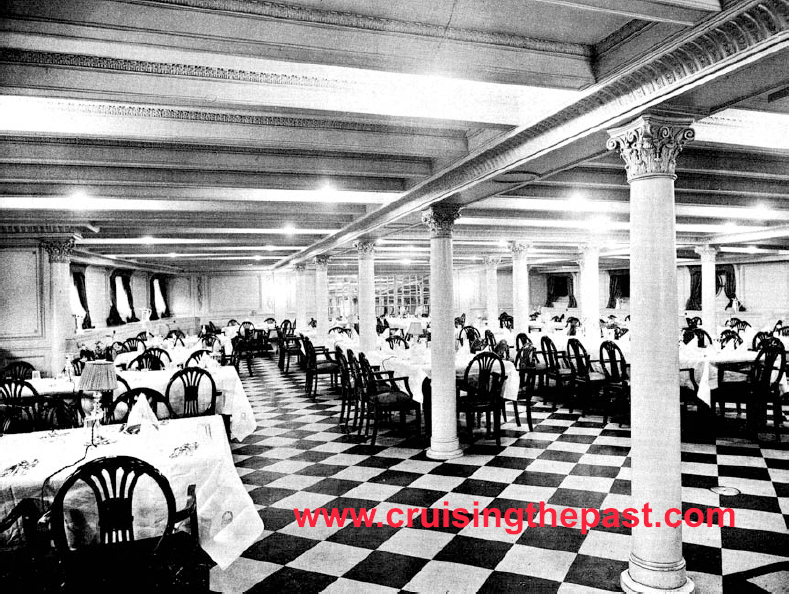 The dining salon on the elegant small liner. The sinking made the cover of Life Magazine – 1952. At 5,878 tons, and 369 feet, the Princess Kathleen was built by John Brown & Co., Clydebank in Glasgow Scotland and launched in 1924. Canadian Hockey team on the Princess Kathleen. On her maiden voyage, she sailed from Glasgow to Vancouver via the Panama Canal. 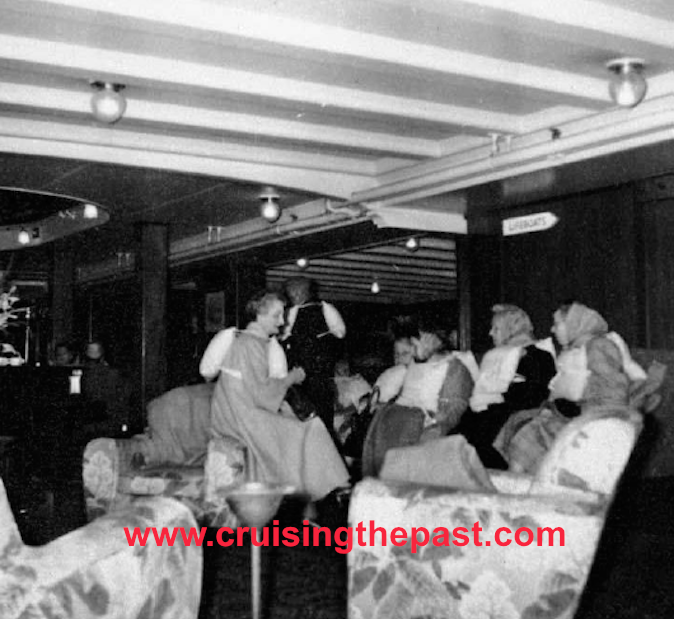 Once in service, the Princess Kathleen and the Princess Marguerite relieved the existing sisters, the C.P.R.S.S. Princess Charlotte and the C.P.R.S.S. Princess Victoria on the premiere “triangle service” between Vancouver, Victoria, and Seattle. This was the exact route for which the new “twins” were intentionally built. 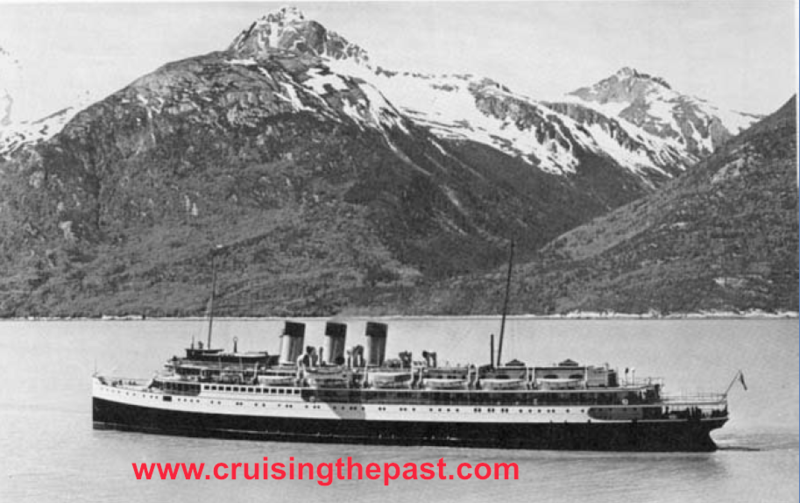 With a capacity of 1,500 passengers, 290 berths, 136 elegant staterooms, a classically designed dining room that could seat 168 passengers and the ability to carry 30 automobiles, the Princess Kathleen and Princess Marguerite provided a new style of luxury and the latest word in comfort. 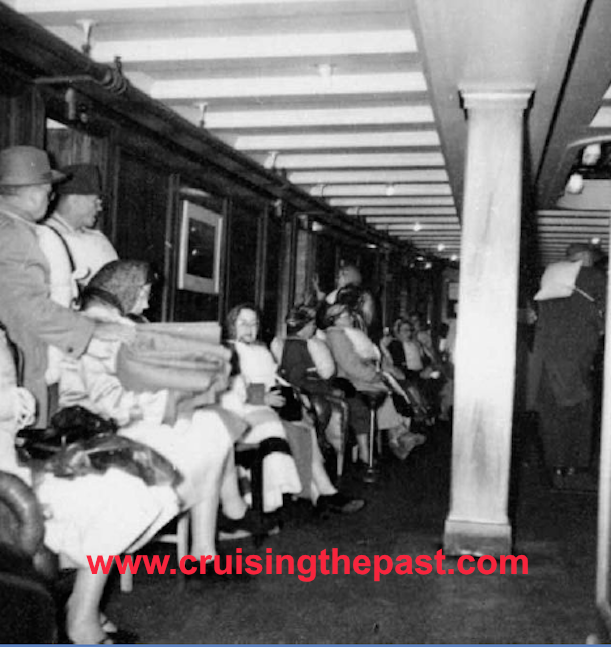 Quite quickly the two sisters became the preferred ships on this service, successfully competing against their biggest rival for the passenger market, the Black Ball Line. Eventually, both of the sisters were later modified to carry 1,800 passengers by reducing the number of staterooms to 123. In September 1939 the Princess Kathleen and the Princess Marguerite were requisitioned by the Royal Canadian Navy for use as troop ships. Sadly, the Princess Marguerite was lost in action during World War II off of Port Said in August 1942 with the loss of 49 lives. 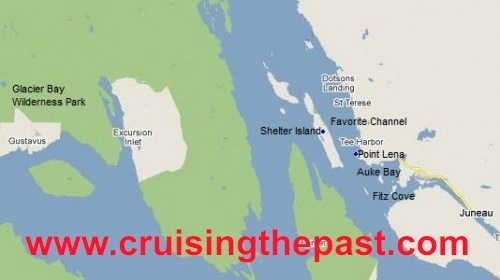 Changing demands and increased automobile traffic saw Canadian Pacific transfer her in 1949 to the Vancouver – Alaska cruise service along the spectacular Inside Passage. 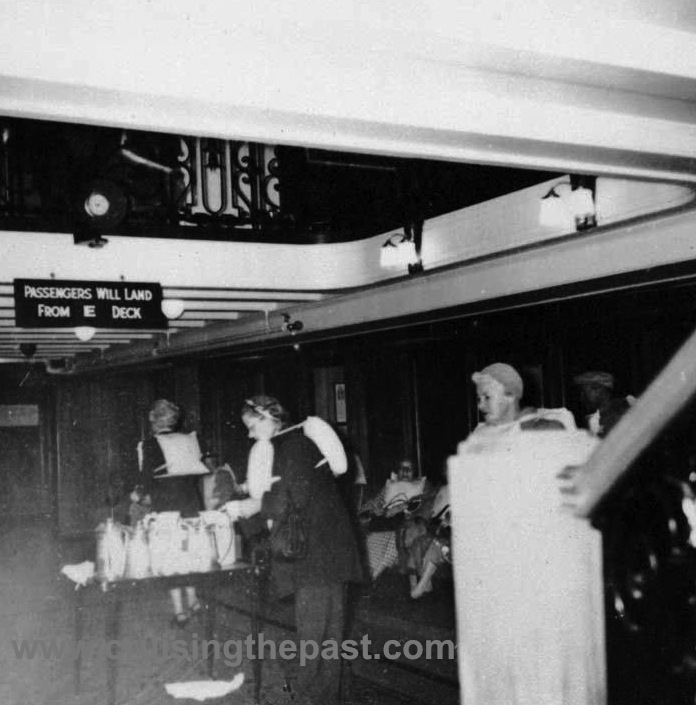 Passengers waiting to board lifeboats – coffee and the final moments aboard a Princess. 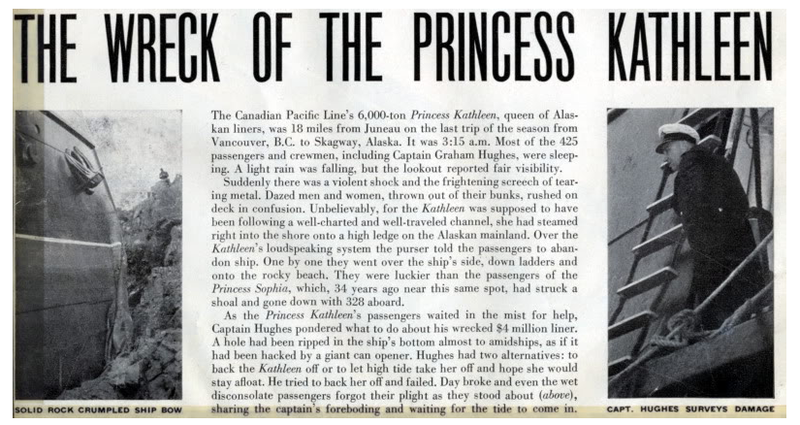 During the 1950-51 cruise season, the Princess Kathleen had a brush with fate, when she and another ship, the Prince George, both equipped with radar, collided during heavy fog in September 1951, 27 miles northwest of Prince Rupert. 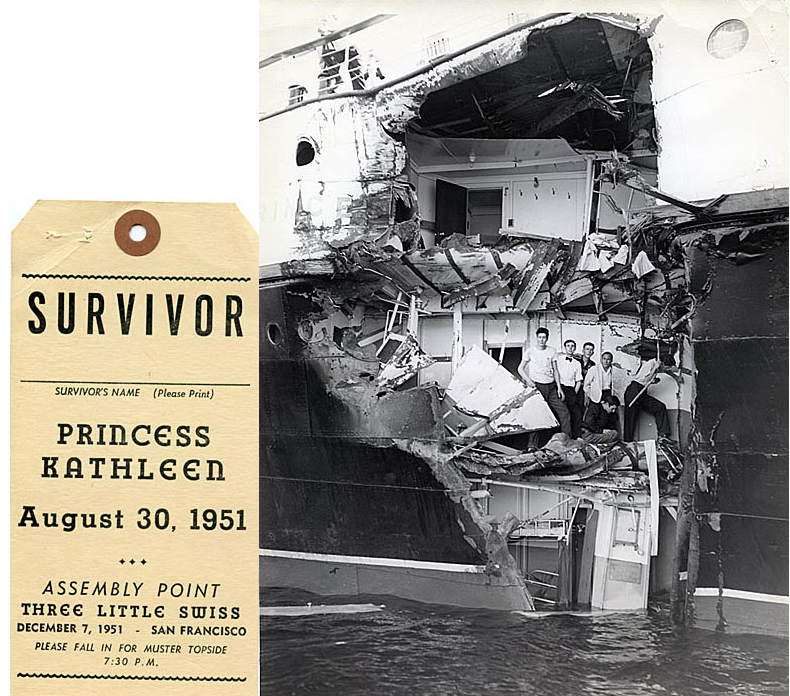 All passengers were mailed this souvenir… Princess Kathleen had escaped… But her fate would change the following year. Damage to the Princess Kathleen approached $250,000, while approximately $100,000 damage was inflicted on the Canadian National steamer. Passengers in life jackets – a Princess ready to sink. Passengers were told to report to their lifeboat stations, but neither ship was in any immediate danger of sinking and the Princess Kathleen was able to reach the nearest port (with lifeboats swung out and ready for launching) by morning. All passengers were later mailed these photos from Canadian Pacific of the damaged bow. It was while on this same service that the fates, still determined it seems to thwart her, finally caught up with Princess Kathleen for good. On September 7, 1952, while on the final Alaska cruise of the season, the trim three-stacker encountered heavy squalls and poor visibility while traveling between Juneau and Skagway. At the time, the Chief Officer Charles W. Savage ordered a simple change, of course, to steer the vessel into the middle of the channel, this being done after seeing the traditional and regular sight of the Shelter Island Light. 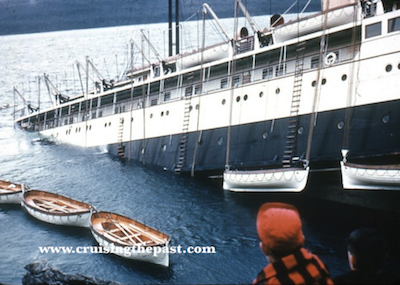 The strong tides of Lynn Canal aided the wind in setting the Canadian Pacific coastal liner off her course to port. Heavy rainfall made it difficult to detect her dangerous swing toward shore. 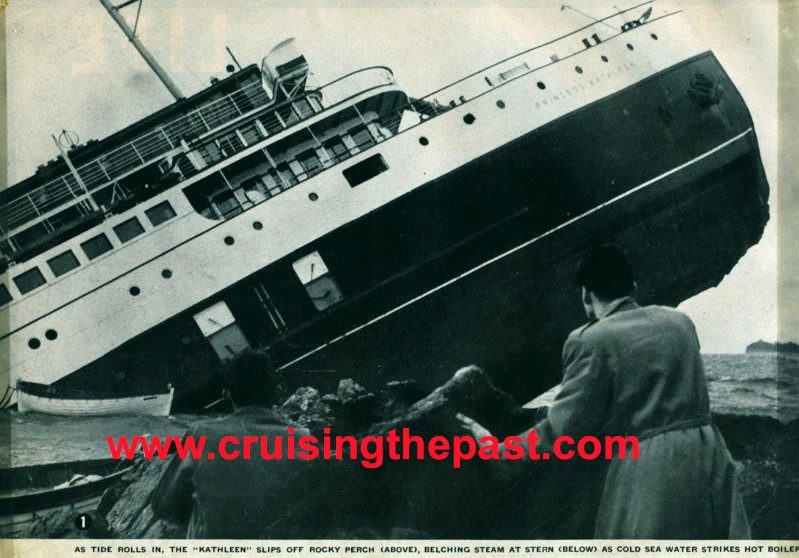 Soon the passengers would be ashore – but the ship underwater. Savage in charge of the bridge had ordered the change of course to starboard. After some time on the new course, he picked up his binoculars and stepped to the bridge wing to look for landmarks or navigation lights. As he did so, the lookout shouted, “Land”, but as it was through the intercom system and, as words tend to become indistinguishable when shouted into the microphone, the rest of his message was lost. The mate ran to see what the lookout had sighted and found the quartermaster had kept the helm to starboard. Then, for the first time, he sighted land, but it seemed some distance off. In hindsight, Princess Kathleen should have moved to mid-channel, then return back on the original course. However, instead of giving the correct order to steer starboard then return to course, the Chief Officer Savage mistakenly gave a command to just steer starboard. Eventually, when the error was discovered, the chief officer soon saw land ahead and in a last ditch effort to avoid a collision, he ordered the vessel hard-a-starboard, but it was too late. 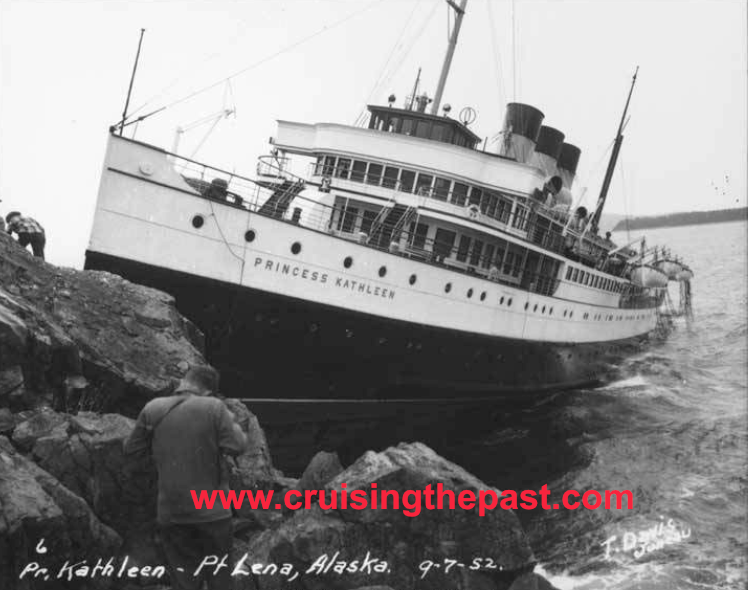 At 2:58 am, the Princess Kathleen ran aground at Point Lena in Alaska’s Lynn Canal, North America’s deepest fiord at low tide. It was later determined that radar was not operational at the time of the grounding. A company spokesman later told the press that whether or not to turn on the radar was a decision made by the officer in charge and apparently Savage did not deem the situation radar worthy as the Princess Kathleen traveled off shore at a speed said to be 9 knots. Initially, Savage’s crew sent out an SOS on the wrong frequency. It would be two hours later before the United States Coast Guard would become aware a Canadian ship had been grounded on their shores. When the USCG got wind of the plight of the Princess Kathleen, they immediately sent a cutter that had been towing a fishing vessel to the scene. After assessing the damage to the bow, Captain Graham O. Hughs of the Princess Kathleen attempted to reverse her off the rocks, but she stuck fast and was unable to be moved. To be on the safe side, the passengers and lifeboats were readied for the possible evacuation of the vessel. 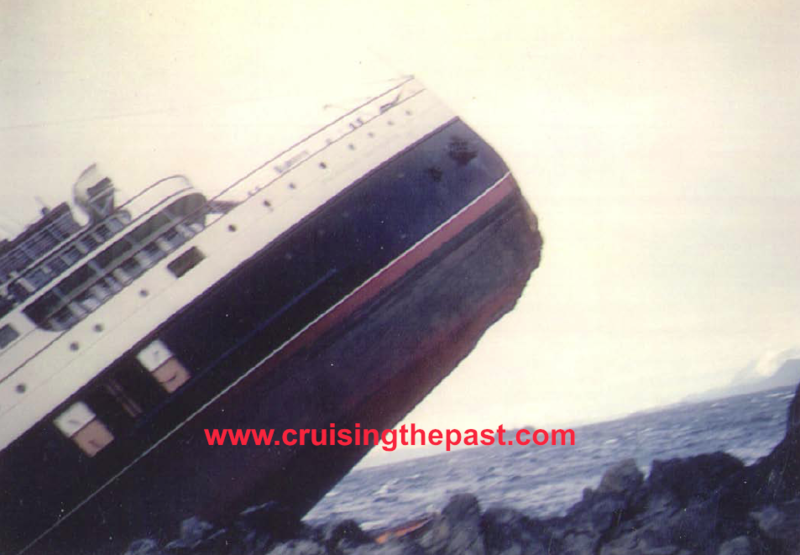 As the tide continued to fall, the Princess Kathleen took on a very decided list and with increased winds picking up; her stern was soon driven against the rocks causing further damage. By 5:30 am and in driving rain the list was at 19 degrees and the captain decided to have the waiting lifejacket clad passengers evacuate the ship. 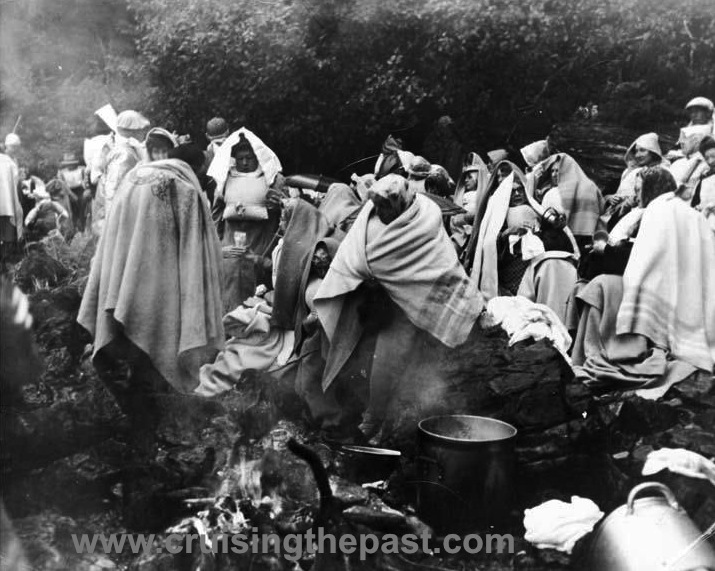 While waiting for help, the waiting passengers built campfires onshore to keep themselves warm. One report by a historian notes no panic at all, but some stranded passengers assumed they were on an island, only to find out later they would be led on a bushwhack through the forest for a mile and a half to a nearby road to reach buses that would transport them into Juneau. One person reportedly had a heart attack later in the lobby of the Baranof Hotel. The United States Coast Guard rescue cutter arrived at 6:30 am and eventually the cutter made two trips to evacuate about 150 remaining passengers and by 9:00 am all 307 passengers had safely disembarked from the stricken vessel. The final moment. Then no more Princess. However as the tide rose, her stern became swamped and started to flood. 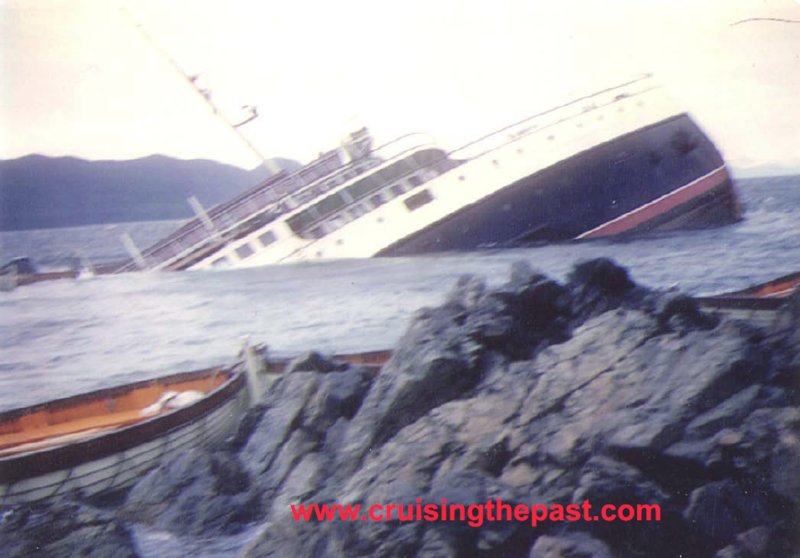 With the incoming tide encroaching on her perch and with her bow still on the rocks, the Princess Kathleen flooded even further, to the point that at 11:30 am, the captain and 80 crew gave up on trying to save her and abandoned her to the elements. At 12:30 pm, ten hours after running aground, the Princess Kathleen slipped further and further off the rocks and into the sea. Her bow finally resting about 50 below the surface of the water, the stern 120 feet below, with about an 80 degree list. She had 155,000 gallons of bunker C fuel or also known as No. 6 fuel oil on board when she sunk. With her precarious position right after sinking and coupled with an age of 27 years it was determined that salvage was too costly and she was left there. 300 of the passengers and crew sued the CPR for $1,119,000. Later, in May of 1954 the claims were settled with approval of a US District Judge for $190,000. The Alaskan waters claim a Princess. Previous: CHASEN’S – The world-famous Hollywood Celebrity restaurant opened in the late 1930s and lasted into the 1990s.